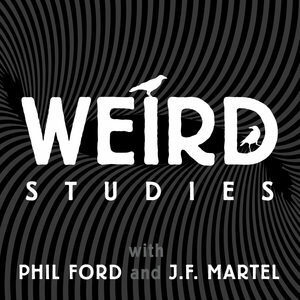 Weird Studies, a new art and philosophy podcast I've been developing with professor of musicology Phil Ford, is now live. New episodes will appear every other Wednesday. Eventually, we may crank it up to one a week. "Weird Studies" is a scholarly field that doesn't and can't exist. The Weird is that which resists any settled explanation or frame of reference. It is the bulging file labelled “other/misc.” in our mental filing cabinet, full of supernatural entities, magical synchronicities, and occult rites. But it also appears when a work of art breaks in on our habits of perception and ordinary things become uncanny. The Weird is easiest to define as whatever lies on the further side of a line between what we can easily accept from our world and what we cannot. And it defines an attitude towards whatever lies on that side of the line: a willingness to remain suspended between explanations and abide in strangeness. Phil and I have been recording material for the show since September. We decided to launch the show with two episodes, a short "Introduction to Weird Studies" where we discuss the concept of the weird outlined above, and a longer, crazier one titled "Garmonbozia," which intersects Twin Peaks: The Return with the creation of the atom bomb to say something about the underlying mood of the present age. Our modus operandi is to discuss whatever topic strikes our fancy in the hope that others will dig them as well. Upcoming themes include Arthur Machen's terrific novella The White People, the occult power of Dungeons & Dragons, the spectre of nihilism haunting contemporary academia, bloodsports, and lots of others. Over the last couple of years, Phil and I have indulged in a correspondence that passed the 100,000-word mark a while ago. This is our way of taking the conversation online to see what happens. Some serious acknowledgements are in order here. Joseph Cook did an amazing job designing our logo, and Matt Melanson gave us an awesome illustration that conveys the weird mood. My brother Pierre-Yves Martel wrote the theme music and the transitions between segments, and my wife Lesley Halferty recorded the intro and outro. Big thanks to all four for freely lending their formidable talents and skills to the project.